Air pollution is the 4th highest risk factor for death globally, and by far the leading environmental risk factor for disease. One of the best ways to limit this risk for your customers and their loved ones is to take measures to improve IAQ in their homes. IAQ stands for indoor air quality, and you may be surprised to know that the air indoors can be up to 5x more polluted than outdoors! In this article, we’re going to go through 5 HVAC (heating, ventilation, and air-con) tips that can help your customers improve IAQ in their homes. If your customers want to lower the level of indoor pollutants in their home, then one of the best ways to do this is to increase the amount of outdoor air coming in. This is particularly important while they are partaking in activities that generate high levels of pollutants, such as painting, cooking, soldering, sanding etc. But it is also important to get a cycle of outdoor air into the home on a regular basis. If your customers live in an area with lots of fresh air, they can introduce outdoor air into their homes through natural ventilation, by opening windows and doors. However, we know this is not always accessible for people, especially if they live in a big, busy city with lots of vehicles going past. If this sounds like your customers, then you can suggest mechanical ventilation to introduce fresh air into their home. Of course, air can also enter homes through infiltration – the process of outdoor air flowing in through openings, joints, and cracks. If your customers’ homes appear to be suffering from this, then you can upsell them with air tightening to help reduce these leaks. How can you fight pollution without measuring it? If you want to improve IAQ in your customers’ homes, then you first need to know what the air quality is like. 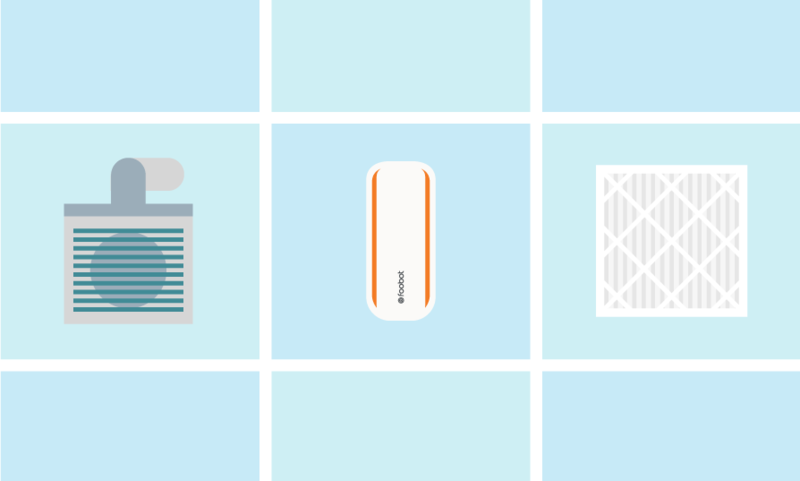 You can find out with the help of an air monitor, like Foobot. Traditionally, air quality monitors were too expensive for consumer use, at around $5K each! But with a consumer-grade IAQ monitor, you can now measure your air quality continuously to make sure that your customers are always breathing clean air. Foobot can detect invisible and odourless pollutants in the environment and then alert you of them through an easy-to-use mobile app or, on your laptop at the office. Through the app, you will get access to charts that track airborne pollutants that can impact the health of your customers. From there, you can use this information to encourage your customers to make small changes in their homes that will make a big difference to their air quality. Air filtration can contribute to improving IAQ in many ways. It allows adequate ventilation and also filters out small particles to reduce pollution. Air filters are also very easy to maintain. All you need to do is change them regularly and test their efficiency every now and then. If your customers want to replace their filters themselves (or they’re just interested in knowing how to do so), let’s advise them about which air filters to choose: they need to measure up their choices against the minimum efficiency reporting value (MERV) rating system, and also HEPA, which stands for “High Efficiency Particulate Arrestance”, and is a must-have label when choosing filters to preserve good air in your customers’ homes. For more information about that, click here. Having proper wall insulation is important for regulating the temperature of your customers’ homes – and it also lowers their utility bills! On top of that, it can enhance humidity control and lowers the chance of mold and mildew developing in the home. But you must be careful because some man-made insulation materials contain pollutants like formaldehyde, which is also a carcinogen. The best insulation materials for healthy indoor air are natural materials like wool, hemp, and wood fibre. Duct sealing is a very effective way to improve IAQ. While most of the tips in this article have been directly linked to pollutants inside the home, pollutants in the outside air, such as pollen, allergens, and contaminants can enter your customers’ homes if the ducts are not well-sealed. Sealed ducts force incoming air to go through the filter, and the result is that only air that has been cleared from particles can enter the home. If your customers suffer from asthma or hay fever, then poor duct sealing can exacerbate symptoms. Inexpensive, easy-to-find, and covered in pretty, bright flowers, Garden Mum’s are a good all-rounder. Despite the name, they can be planted indoors and are proficient at cleaning the air of such pollutants as ammonia, benzene, formaldehyde, and xylene. Snake Plants are one of the most difficult to kill, making them great for beginner plant owners and/or busy people. They prefer dry conditions, but do need to be watered occasionally. The pollutants they can rid your home from are: benzene, formaldehyde, trichloroethylene, and xylene. Peace Lilies are easy to grow, and they look and smell great! The flowers will contribute some pollen into the air, but it will get rid of a large amount of pollutants for the size: ammonia, benzene, formaldehyde, and trichloroethylene. A comfortable home is a happy home. If you follow our HVAC tips then you will be breathing healthier air shortly. For more information about Foobot and how it can help you detect invisible pollutants, check out our features page.